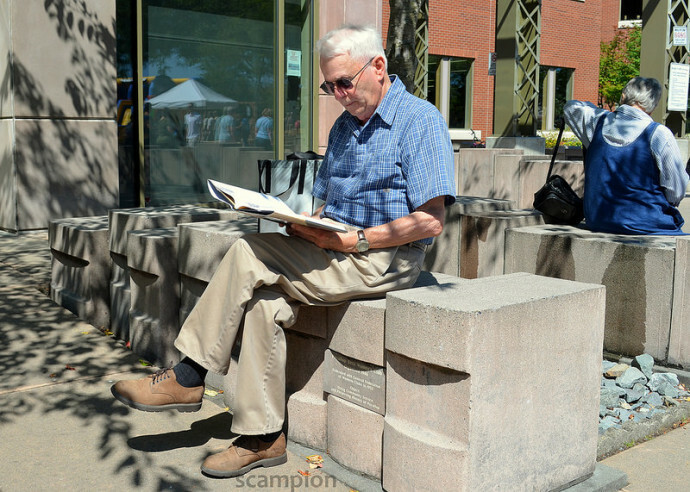 He was reading quietly while two women talked nearby. I decided to ask if he’d mind me photographing him. One of the women interjected right away: “Yes, you may,” she said. “He’s a very handsome man. You have my permission to take his picture.” Turns out that woman was his wife. On her own initiative she stood up to remove herself from the frame and that’s when the man and I began to talk. It was a very enjoyable chat that lasted quite a while. They were visiting from California, but before California — “long ago,” he said — he had attended Puyallup High School. He and his wife (who is from Wales and is “much smarter than I am”) have lived in the Golden State for more than 30 years. This trip to Puyallup was a happy one for him. “I’ve always liked this town,” he said. It has a good feel. Eventually one of the women told him their ride was here and it was time to go. He stood up and introduced me to them as his new friend. That pleased me a great deal. Then, watching his wife walk away, he turned to me and said with a smile “tomorrow’s our anniversary.” I said congratulations and wished them the best. I regret not photographing them together, but knew they had to leave. I didn’t ask. In a way, though, I did photograph them together. That’s her sitting in the background. Happy anniversary.